I am daydreaming a bit; contemplating the challenges of this past year, while counting the many blessings that accompanied those challenges. The hopes and dreams of the refugee children I serve came true because of your selfless generosity and support. Dreams…Speeches have been written about them and songs tell us, “All I have to do is Dream”, “Dream a Little Dream of Me” and “Dream On.” We are told that for the most part, children are the most natural, prolific, and happy daydreamers and that the process actually plays an important role in developing their lives. In fact the most dynamic and innovative people in any endeavor are visionaries….dreamers. Today I am going to share with you my dream. It has been a secret aspiration for years; a contemplation of the idea that all is possible. I have shared it with only a few loved ones; those I hold closest to my heart. My dream like all other dreams gives me hope and helps me get through the rough patches in life. My feeling is that without dreams, the world looks gray, without possibilities, energy, and motivation. I dream of writing a children’s book someday; I pictured myself sipping tea, overlooking a forest somewhere, gazing at flowers and watching birds building nests for their little ones and baby deer tip-toeing across the grass. I am barefoot and in sweats of course, and there is soft music in the background playing; all the simple pleasures in life that money can’t buy are at my fingertips, yearning to inspire me with just the right words that will touch a child’s heart and imagination; encouraging them to believe that all is possible. I work for Catholic Charities and our mission statement calls for me to serve the poorest of the poor; many who have lost hope and the ability to dream and believe that all is possible. 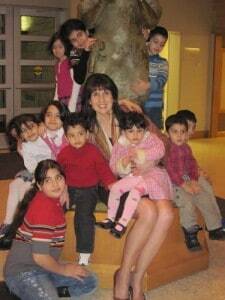 The refugee children I serve have experienced great heartache at a tender age. The children I serve in the community may not be refugees, but many have dealt with their own struggles, pain, and disillusionment. They have handled more challenges in their youth than many of us tackle in a lifetime. I fear that if they stop believing as children due to the discouragement that comes from heartache, if they stop seeing the good in others and attempting to walk in another’s shoes in order to tap into their virtue of empathy, they are doomed to a life of bitterness, resentment, and unfulfilled dreams. Ahh…did someone say shoes? What if a child slipped his feet into a pair of shoes and in that magical moment felt all the pains, joys, and sorrows of the owner of the shoes? What if a child was on a shopping spree and walked into the local Goodwill or Salvation Army store and saw a section filled with shoes? What if they had the ability to try each pair on and instantaneously a rush of feelings, thoughts, and emotions allowed them to experience the moments of joy and pain that were associated with those tattered tennies, worn out work boots, or chipped high heels? Better yet, what if the shoes talked? Perhaps, those sandals could take them on a journey to a refugee camp and those slippers transport them to a children’s hospital where they sat for weeks waiting for a boy with Cystic Fibrosis to slip his feet in and take his first steps after surgery. Maybe, those weathered work boots that were patched up with cardboard daily, in order to keep toes dry, could take them on a journey to a hot warehouse where a father labored tirelessly for minimum wage in order to support his family. Why do you think it is so difficult to hang on to our ability to dream and believe that all is possible after we become adults? Why do we stop seeing the good in others, and choose to judge them before we have the benefit of really knowing them? Why do we pass by the opportunity to slip our feet into that pair of shoes so we can be transported into another’s life of joys and sorrows? I think I have the answer to the last question. Sometimes, I think they are just too tight! I get so comfortable in the shoes I have worn for years that I don’t want to try on others. I get consumed with my own desires and definition of happiness that I forget how important it is to bring happiness into the lives of others. I have a lot of favorite books, but with all due respect to the accomplished authors, my favorites are still children’s books. When I go to the bookstore or library, I am always drawn to them like the smell of freshly baked chocolate chip cookies coming out of the oven. I can read my favorite ones over and over again, because the words and pictures magically call out to me. I guess I may have a bit of the Peter Pan Complex. Sometimes, I just don’t want to grow up. Maybe that is why I have such a strong connection with children. I admire their genuineness and that enkindles an overwhelming desire to remain childlike. Jesus tells me I should remain childlike in my faith. In fact, his parables remind me of children’s books, and I look forward to reading them because they are simple and paint vivid images in my head that help me clearly see what complex readings cloud. I am feeling if I had the ability to slip into Christ’s torn and tattered sandals, I’d make better choices; love more and hurt less. I think I have my resolution for this coming year. I am going to write that book and try on more shoes with hopes they fit; even if they are a bit tight. I have a dream that all is possible. I thank you for your kindness to me and those I serve. The refugee children I care for will be safe and secure in warm beds tonight, attending school tomorrow, and reaching for their dreams because you help me make it happen. I hold your friendship close to my heart and ask God to bless you with sweet dreams!